The Jewish community in Ventura County goes back to the 1870’s but it was not until 1938 that the Ventura County Jewish Council (VCJC) was formed as a Jewish benevolent and social organization. The first meeting place for the group was a room in a Coca-Cola bottling plant. In 1943, led by Ed Kraus, First President of VCJC, we purchased a former dairy at 2500 Channel Drive in Ventura, which became the first permanent home for the Jewish community. 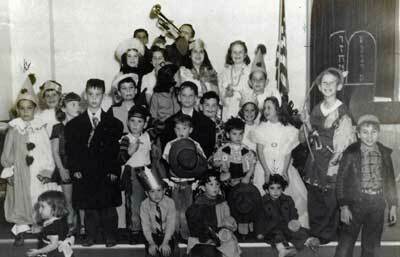 During the 1940’s the VCJC saw the beginning of regular Friday night services and the religious school, the choir, many social activities, and the hiring of the first full-time Rabbi, Rabbi Meyer Simon, who served from 1949-1952. It was a time of other “firsts” as well, including first Bar Mitzvah, first wedding, and first community Seder. By the late 1950’s the Jewish community had been growing along with the rest of Ventura County and we decided that the dreaded phrase “Building Fund” would be used for the first time in the community. In 1957 the Building Committee, led by Ronald Bank, started a successful drive to raise the funds needed to purchase land on Foothill Road in what was then the outskirts of Ventura. The site was a lemon orchard. After much debate about priorities it was decided to build an all purpose social hall, chapel, and eight classrooms. Construction started in 1962 and the move came in early 1963. The change also led to the recognition that the name of a Temple should be added to the VCJC. Although the idea of one Jewish council to meet all the needs of the whole community was still seen as important, we recognized that we needed to focus on Judaism within the context of a Temple, as that was what had actually evolved. The name to this day reflects both ideas: Ventura County Jewish Council/Temple Beth Torah. The decades following the move to Foothill Road were filled with growth and development. As the congregation matured we added a full time Temple educator, certified teachers and a nursery school. Sisterhood and Brotherhood became active organizations playing a vital role in Temple life. In the 1980s funds were raised for more classrooms and the long-awaited sanctuary. After much hard work and planning the classrooms were built and in 1985 our beautiful stained glass windows completed the warmth and beauty of the sanctuary. The 1990’s saw more progress with the remodeling of Meister Social Hall and the expansion of the Bank Family Library. Rabbi Lisa Hochberg-Miller became Rabbi of Temple Beth Torah in 1997, and with her colleagues, she has continued to nurture the rich traditions of the community into the new century. At the same time we have seen exciting innovation in education, from a new Jewish preschool to adult b’nei mitzvah, and services that connect to congregants with music and spirituality. Under the direction of our gifted and caring professionals and our congregational leaders, Temple Beth Torah will continue to play a vital role in the lives of our congregants and the Jewish community.